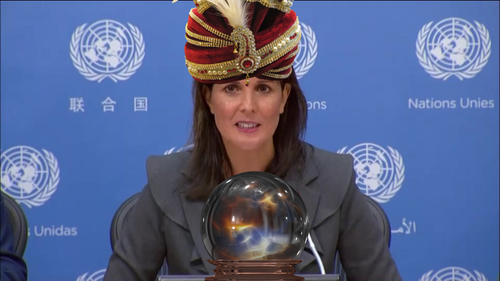 “If they want to continue to go the route of taking over Syria, they can do that,” said Nikki Haley at a UN press conference today, without explaining how a nation’s only recognized government can ‘take over’ the country it governs. Here is a declassified CIA memo from 1986 in which the Central Intelligence Agency is seen exploring ways in which sectarian tensions can be inflamed to provoke a violent uprising in Syria. Here is a useful articlefeaturing excerpts from the memo showing some jarring parallels between what was being planned and what happened a quarter century later.